Exciting news from the studio today. 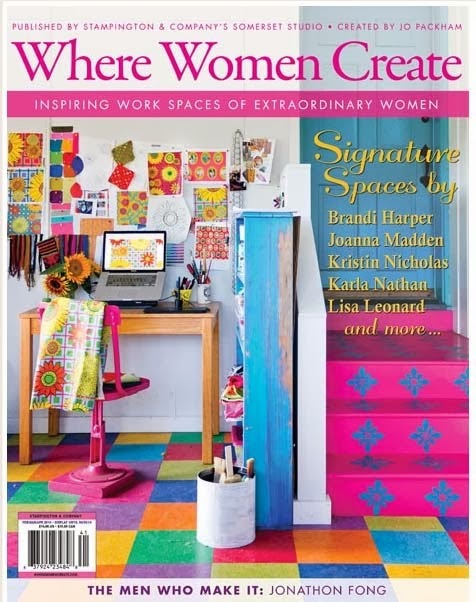 My sweet little crazy messy studio is featured in the latest issue (Spring 2014) of Where Women Create. Not only is it featured inside but it is on the cover. Wow! There are 10 pages inside and an article written by me about how this artsy-craftsy-textile life came about. How fun is that? You can pick up the magazine at Barnes and Noble and Joann's Fabrics. Or you can order on-line here. Thanks so much to Jo Packham for inviting me to be featured and to Rikki Snyder for taking the colorful photos. Just to give you all a little back-story, we shot the photos at the end of one of the days of the first photo shoot week for my upcoming book. It was pretty insane and we were both so pooped and exhausted. What were we thinking? But the photos came out great and evidently stunning enough to be on the cover. Thank you Rikki! How exciting! Can't wait to pick up a copy. Congratulations! Can't wait to pick up a copy. You must have the most colourful studio in the world - looks fantastic. "Cover Girl"!!!!! Congratulations! Will pick up a copy! I just read your article in my favorite magazine, Where Women Create, and decided to visit your blog. I love to knit, crochet and needle felt, so naturally I needed to visit. Also, you said in the article that your were from NJ, 35 miles west of NYC. I am originally from Wayne, NJ. I still live in North Jersey but not Wayne anymore. I am definitely going to check out your sunflower book. It sounds like it is right up my alley. Congratulations on being featured in Where Women Create. Good luck with your new book. I will be keeping an eye out for it. It sounds wonderful! That's so awesome! I just love, love those steps! :) Happy getting close to end of winter! !